We have been meeting the unique product needs of US Soldiers, Sailors, Airmen, and Marines for decades. Every design is based on direct feedback from members of the US Armed Forces that put our products to the test daily. Icons like the Mark I, Mark II and Guardian series were some of the first available knives designed for use in combat. Today, innovative products like the Cable Dawg , LMF II and the De Facto serve alongside the standard issue Gerbers each soldier deployed downrange has received: the MP600 and the Gerber Strap Cutter . Proudly made in Portland, Oregon, our Gerber Military line combines ingenious designs, the toughest materials, and the sharpest blades to ensure that every soldier has the best no matter how or where they serve. From small game to the epic trophy, Gerber gear equips you for the hunt and everything that comes after. Designed to be evenly balanced and tough, we make hunting specific gear with long-lasting blades, tactile handles and all-weather sheaths. The renowned Gator series is still an all time favorite and paved the way for a collection of the most innovating hunting knives to hit the shelves: The Myth series. Gerber knives, tools and gear hunt just as hard as you do. Together with Bear Grylls, Gerber creates essential survival tools for everyone who ventures into the wild. From a scout on their first overnighter to a seasoned adventurer exploring the backcountry, Gerber Survival products are designed to solve the toughest problems and stand up to the worst nature can throw at you. The Ultimate Fixed Blade , a Gerber flagship, is one of the most recognizable knives in the world. With just your hands, your head and your tools you can account for everything needed to stay alive in the wild. The proper tool can be the difference between life and death. Gerber’s Tactical line was created with this in mind. Every single tool is built for a specific purpose to make the job of police, firefighters, and EMTs easier and more effective. 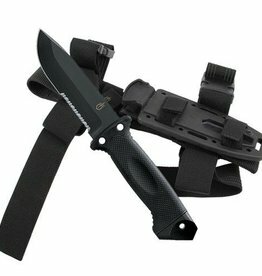 Staples in the Tactical collection include theCovert series knives developed in partnership with one of the nation’s top authorities on close-quarters combat and fighting knives, Colonel Rex Applegate. It is no surprise that these knives are recognized internationally as best-in-class among tactical folders. In your pocket or on your belt, a Gerber Tactical product can change the outcome of a bad day. They've rightfully earned a reputation for unmatched strength, balance and durability. Hiking, Camping, and all things outdoor. Save the day items like the E-Z Out Rescue are commonplace on rivers across the country and new additions like the Steady are breaking ground in the industry and challenging the status quo on what tools can do. When tested in the elements, Gerber’s Outdoor gear shows its true colors – functional designs constructed with rugged materials. Deserts, Mountains, Forests – These are the ones to carry in the wild and open spaces. For in the truck, the shop, or your pocket, Gerber Essentials are the tools and knives that get us out of unexpected jams every single day. They’re the pocket-tools, multi-pliers and everyday carry items that we reach for over and over. Size isn’t always an advantage. The Compact Sport MP400is a best-selling tool that's just right for the pocket and one of a number of award-winning tools that utilizes Gerbers patented one-hand opening technology. The Gerber LST (Light, Strong, Tough) will fit in any pocket and, with millions sold, is probably in a pocket near you. In line with their heritage, newcomers to the Essentials collection are redefining what it means to carry a knife, and our designs Venture into new places that compliment even the most polished look. For well-made tools built for daily abuse on the job site, Gerber’s Industrial line can’t be matched. Constructed with advanced materials, both lightweight and indestructible, every tool is designed for all-day efficiency and durability. Must have’s like the Legend are the benchmark for the Industrial get-it-done multitool, and we dared to dream with the new Groundbreaker – the innovative new 14 function tool for the electrician in all of us. Being versatile isn’t enough for the guys who design these tools: they have to last. And they will for a lifetime. Met de STRONGARM-serie biedt Gerber één top mes voor ruig, tactisch en militair gebruik . De geribbelde handgreep zorgt voor een veilige grip, zelfs in vochtige omgevingen.